Interpretation and Application of Schedule 1(1) & 1(6) of the Firearms Act 1996. The Firearms Act 1996 (‘the Act’) provides for the regulation, registration and control of firearms in Tasmania. The holder of a licence issued under the Act may apply to the Commissioner of Police for a permit to acquire a firearm of the category to which his/her licence relates (Section 58). A permit cannot be granted unless the Commissioner is satisfied (amongst other things) that the applicant is the holder of a licence authorising the applicant to possess or use that firearm (Section 60(4)(a)). Delegates of the Commissioner of Police are responsible for receiving, assessing and processing applications for permits to acquire firearms. There has been no change to this section of the legislation since it became law in 1996. (b) In any other case, that firearm. The categories of licences and the firearms to which they apply are set out in Sections 14 to 18 of the Act. Prohibited firearms are those referred to in Schedule 1 of the Act. Some of these firearms may be the subject of a licence issued under the Act. Some however may not. 1(6) Any firearm that substantially duplicates in appearance a firearm referred to in item 1. (ii) Permits to acquire firearms are appropriately granted. A person who wishes to register a firearm or to obtain a permit to acquire a firearm, is required to include details of the make and model of the firearm in the application. If no reference image can be found, request photographs of the firearm from the applicant. After details of the firearm are collated, if it is considered that a firearm may fall within Schedule 1(6), the application will be referred to the Firearms Categorisation Assessment Committee (FCAC) which will consider whether the subject firearm substantially duplicates in appearance any known machine gun, submachine gun or other firearm capable of propelling projectiles in rapid succession during one pressure of the trigger. (c) A member of Tasmania Police, Ballistics Services. (d) A person independent of Firearms Services who has technical expertise in firearms. The FCAC is not a decision-making body. Its role is to assist the Manager, Firearms Services (as the delegate of the Commissioner of Police) in making a decision whether a firearm falls within Schedule 1(6). No member of the FCAC should have any personal pecuniary or commercial interest in the sale of firearms. The wording of Schedule 1(6) should be interpreted in accordance with its ordinary and natural meaning. The focus is upon the appearance of a particular firearm and not its function, calibre, purpose or manner of operation. Thus, a firearm which may ordinarily be categorised as an A, B, C, D or H firearm by virtue of its manner of operation, may fall within Schedule 1 (6) because of its appearance. In assessing whether a subject firearm falls under Schedule 1(6), the FCAC should consider whether or not it substantially duplicates in appearance a known model or models of machine gun, submachine gun or other fully-automatic firearm (“the reference firearm”). The length, features and visual characteristics of the subject firearm should be compared with the reference firearm. The similarities should be noted in order to judge whether, overall, the firearm is “substantially” the same as the reference firearm. The fact that there may be some differences between the subject firearm and the reference firearm does not prevent a determination from being made that they are substantially the same. The Manager, Firearms Services, as the Commissioner’s delegate, is entitled to inform himself or herself in any way as he or she sees fit in order to exercise the powers conferred by the Act. 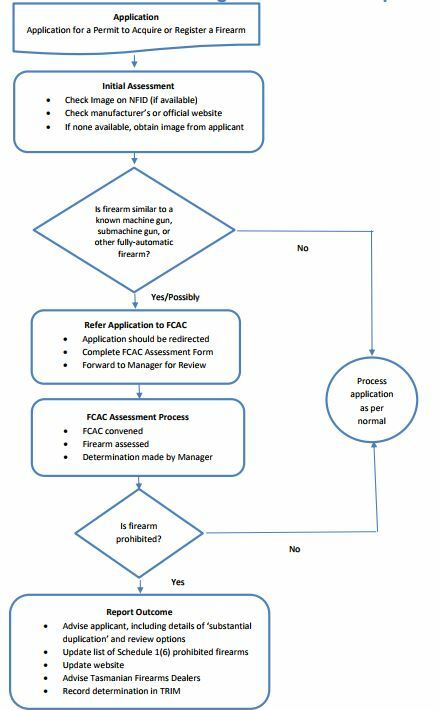 In addition to the FCAC, the Manager, Firearms Services may seek advice from an appropriately qualified source when deciding whether a subject firearm falls within Schedule 1(6). A person who is aggrieved by a decision of the Commissioner’s delegate to refuse to register a firearm on the grounds that it falls under Schedule 1(6), may request the Commissioner of Police to review that decision. Any such request must be made in writing within 28 days of receiving notification of the Delegate’s decision. Pursuant to Section 141(1)(a) of the Act, a person may apply to the Magistrates Court (Administrative Appeals Division) for a review of a refusal to grant a permit to acquire a firearm. Any changes to a firearm after it has been registered or acquired (for example, by adding or removing accessories) may have the effect of altering its overall appearance and bringing it within Schedule 1(6). If the Commissioner’s Delegate determines that this has occurred, the registration for the firearm will be cancelled. To ensure that a firearm’s registration is not cancelled as a result of any appearance based modifications, it is recommended that its owner confers with Firearms Services prior to significant changes being made to the firearm’s appearance. These guidelines will be distributed to and discussed with all employees and members of Firearms Services and Ballistics Services. They will also be published on the Firearms Services page on the Tasmania Police website. Advice to all commands within Tasmania Police will be promulgated to ensure members conducting inspections of firearms are aware of the application of Schedule 1(6).